Peter Mulryan was born in the Tuam mother and baby home in Galway and lived in the institute for four and half years. His mother was taken to the Magdalene Laundries, where she spent 45 years. Mulryan’s sister was born 10 years after him. She, too, was taken from his mother. He never found out where she was sent to, but suspects it could have been Tuam. “I was never told where she was, and I’ve never found out. The High Court can’t tell me if she was in Tuam or if she was fostered to another part of the world. She might have been in that ground in Tuam,” Mulryan told TheJournal.ie. “People can’t understand how I stayed so level-headed and held my past in for so long. There was nobody to talk to, we were told to mind our own business and keep our mouth shut. We had no support or respect from the Church either,” he said. Mulryan lived a life of silence and fear for years before gaining the courage to speak out about his experience of living in the home. However, over the past number of years, he slowly began to reach out to other survivors for support. This year, the Tuam mother and babies home came under the spotlight after historian Catherine Corless’ research led to the discovery of the human remains in sewage chambers at the Tuam site. Her research revealed the deaths of 796 babies and children at the home. As the news broke, little by little, Mulryan found like-minded people who were also looking for support and a safe space to talk about their past. From there, the Tuam Home Survivors Network was created. Mulryan became chairperson of the network. The network aims to reach out to others who share similar experiences in a peer-to-peer supportive manner. So far, the network has 22 members. Mulryan said it has given him a “new lease of life”. “Now, I can go out and tell my stories. Over the past 70 years, I was silenced and I couldn’t talk about my problems. Now, this avenue has opened up and it means so much,” Mulryan said. “We all help and support each other as much as possible. We’re even going to have our first Christmas lunch together this year,” he said. It has created a new family in my life which didn’t exist before. Archaeologist and secretary of the network Breeda Murphy explained the importance of having a network for anyone affected by the Tuam. “They can talk, they can feel, they’re speaking sometimes for the first time, or maybe they’re just listening,” Murphy said. This week, Minister for Children Katherine published the report by the Expert Technical Group on the site of the Tuam mother and baby home. 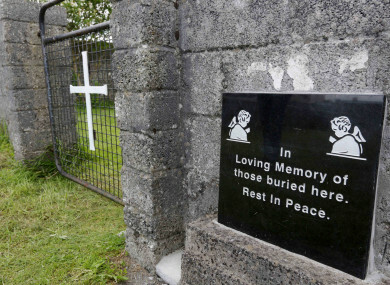 The report was commissioned to compile a list of options about what could be done with the Tuam site and how best to recover the remains of those buried there. However, it notes that it will not be possible to identify many of the remains, pointing out “the impossibility of achieving positive DNA identification of infants and young juveniles without samples from living relatives”. Mulryan stressed his frustration at the delay of identifying all the bodies found buried at the sight. “It’s just such a slow movement. There’s no light at the end of the tunnel. We’re being left out to be blown away in the wind. There is no respect for us whatsoever,” he said. Mulryan told TheJournal.ie that anyone who has been affected by the Tuam mother and baby home and are frustrated of the progress being made in investigations or who are afraid to open up about their past should come forward to the network and receive support. “It should make it much easier for people to feel comfortable speaking now that they’ve heard about us,” Mulryan said. The Tuam Home Survivors Network launches officially today. Information about the network can be found on its website here. Email “'Now, I can tell my stories. I've been silenced my whole life': Tuam survivors network launches”. Feedback on “'Now, I can tell my stories. I've been silenced my whole life': Tuam survivors network launches”.